The SEAS A26 is a 2-way loudspeaker kit, using a 26 cm paper cone woofer and a 35 mm textile dome tweeter, in a compact 28 liter aperiodic enclosure. Carefully designed drivers with complementary response characteristics allow for a crossover network using only two components. The A26 loudspeaker design is based closely on that of the legendary Dynaco A25 loudspeaker, first introduced in 1969. The A25, designed and built by SEAS, was one of the most popular loudspeakers ever produced, with more than 1 million units sold. It was highly acclaimed by audiophiles of the day, and received extremely positive reviews from consumer magazines as well as in the high-end audio press. J. Gordon Holt, founder of Stereophile Magazine, had this to say about the A25: "You will have a hard time buying more musical naturalness at any price... (the A-25s) are quite probably the best buy in high fidelity today." The drivers for the A26 have been designed to closely match the characteristics of the original A25 drivers, while adding the advantages of modern production techniques and materials. The important tonal qualities of the original drivers have been retained, while parameters like power handling, consistency, and durability have been vastly improved. four-layer voice coil contributes to a very well controlled roll off characteristic. The T35C002 is a new dome midrange/tweeter designed in the tradition of the classic 1.5" H087 tweeter, first offered by SEAS in 1968. A coated fabric dome with integral surround, manufactured by Dr. Kurt Müller Gmbh in Germany ensures excellent performance and consistency. The magnet system, based on a powerful neodymium ring magnet contributes to the exceptionally high sensitivity and low distortion of the T35C002. The crossover closely follows the original A25 design, and is a model of simplicity. The use of linear drivers with complementary roll off characteristics allows for excellent performance without the need for complex filter networks. The well behaved roll off of the woofer’s paper cone, aided by the four layer voice coil, allows it to be connected directly to the amplifier, just as in the original. The tweeter is easily matched to the woofer using a first order network; consisting of a single capacitor (3.3 Farad), along with a series resistor (10 Omega) for level matching. The resistor value can be adjusted to fine tune the tweeter level (12, 10 or 8.2 Omega). The SEAS A26 loudspeaker is based on a 28-liter cabinet. Position of the drivers and dimensions of the cabinet walls and vent opening are all very similar to those of the original Dynaco A25. For best performance, these dimensions should be followed closely. Adding internal bracing to stiffen the cabinet is a good idea for the advanced builder, and will further enhance the performance. The cabinet stuffing (50g) is distributed evenly inside the box. The highly damped vent acts as an acoustic resistor, resulting in a non-resonant (aperiodic) system. The quantity of polyfill stuffing used in the vent is 12 grams. We suggest mounting a piece of screening material over both sides of the vent to hold the stuffing in place. Decreasing the vent stuffing will improve the time response of the bass system, but will lower the bass output due to the lowered Q. If, on the contrary, more polyfill stuffing is used, the enclosure will behave closer to a sealed box and a higher Q will be obtained. However, the time response will be slightly deteriorated. We find 12 grams of polyfill to achieve the best balance between the time and frequency performance of the bass system. This amount of stuffing is based on measurements and extensive listening tests. The result is a smooth, yet detailed reproduction where the entire frequency range is in balance. We encourage you to follow the above guidelines, but you may also try experimenting with the stuffing quantities yourself, to achieve your preferred bass performance. A sound pressure frequency response measured in an acoustically controlled listening room is shown. 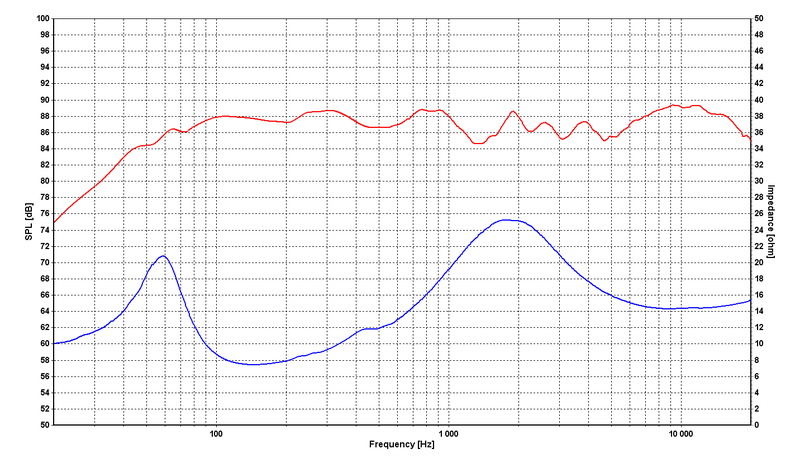 The sound pressure is a healthy 88 dB SPL for 2.83 Volts/1 metre (1 Watt nominal input). The tweeter diaphragm is relatively large for sensitivity reasons. Consequently, the highest frequencies are more directional, making it worthwhile to experiment with toe-in of the enclosures towards the listening position. 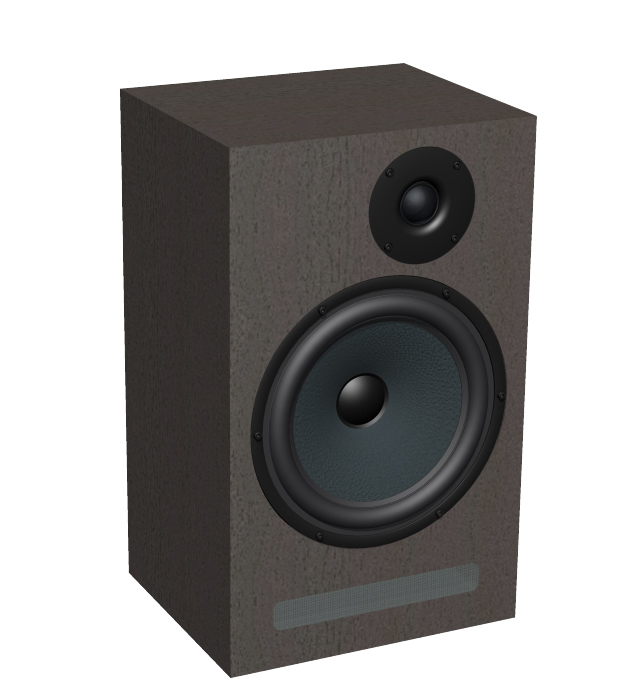 The SEAS A26 is a refined, yet simple and fun loudspeaker, meant for enjoying your music to its fullest!